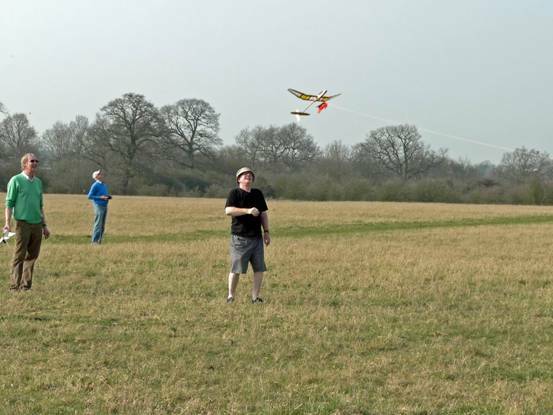 Bungee launched free flight gliders, how hard can it be? 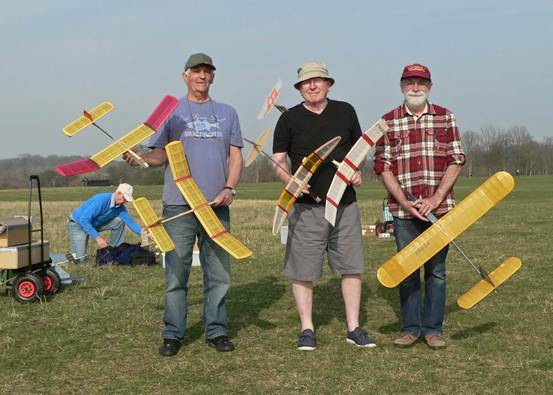 In the depth of winter when all good souls are building next years masterpiece with which to stun the modelling world, Dave Rumball and Paul McMahon came up with the idea of a bungee launched 36" span glider club event with a 1min small field maximum. This was greeted with some enthusiasm by the rank and file and vintage models were dredged from loft, workshop, dusted down and cobbled up from long defunct rubber model surfaces. .I know not why. I am using auto rudder for the glide trim. Here are a pair of 32" Mercury Gnomes built by Dave Rumball. One of these achieved the 1 min max at Ferry March 23rd. 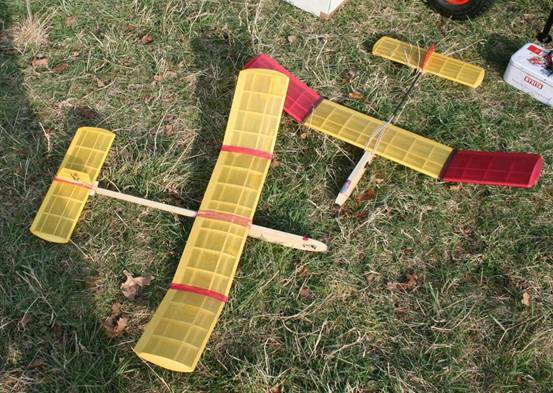 Surprisingly, neither of these has auto rudder but are super stable on launch and have a modest glide turn. A pair of the author's bungee launch models. The smaller is a 24" Angel RC discus launch model converted to electric FF and now persuaded to do duty as bungee launch . It is not competitive and only manages 25-30s on the bungee but is great fun. The larger is a 30" bitsa using a retired E30 wing, a DLG tail and a Poundland fishing rod boom. Trim not yet sorted, best so far is 38s. Pete Gibbons turned up with a 50 year old KK Conquest built when he was a mere 11 years old. It successfully survived a bungee launch and was stable on the line. 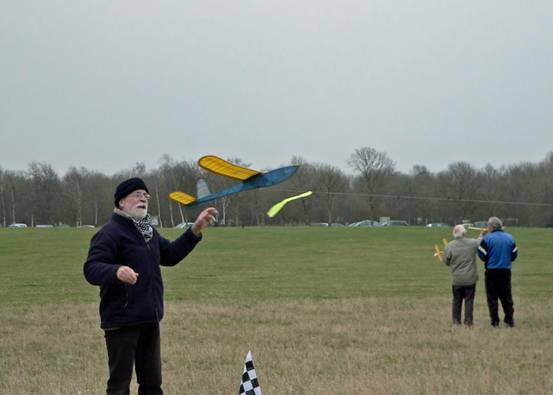 Mick Page was observed taking much interest in the proceedings and one looks forward to his interpretation of a competitive model. We are, however, contemplating a handicap for all Nats HLG champions. Picture courtesy of Mick Page. The Gnome on launch. Picture courtesy of Mick Page. Paul McMahon an instant after release. Picture courtesy of Mick Page. Aged Angel on the way up. Brian Lever looks on in some amazement. Another Mick Page masterpiece. Three wise ? men . See nothing, hear nothing, moan quite a lot about the cost of living, attitudes of the youth and bankers. At least I think it sounded like bankers. 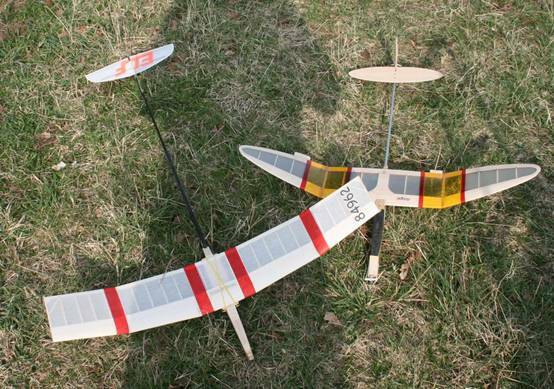 The more I worked on my long moment arm OD Hi Start glider, the worse it got so I parked it and built an enlarged 36" Mercury Gnome based on observation of the success of Dave Rumballs Gnomes. An additional bay to the wing and stab at the 32" span original tail moment arm. 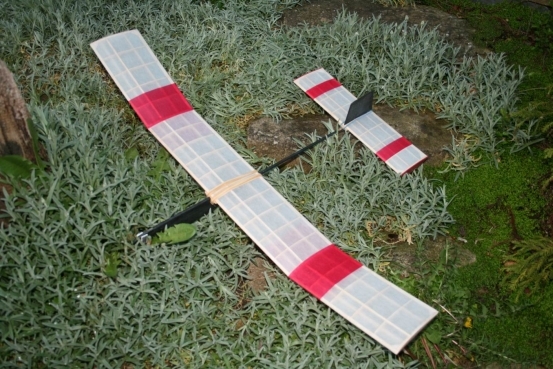 Poundland glass fibre boom with 1 mm tail and wing ribs. Severely reduced TE section with 0.75 mm CF reinforcement. Torsional stiffness quite appalling until I doped the surfaces. Tip panels merely glued on and knock off, no dihedral braces. Flying surfaces covered in Polyspan with Esaki trim, fuselage in heavy weight Modelspan. No DT and no A/R , but a smidgeon of tail tilt for right glide. Weight with a guessed 40% CG is 110gm. Just hoping that this will do better than my OD. 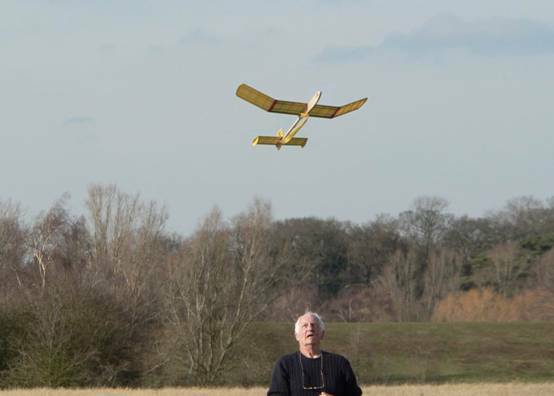 The Big Gnome was flown at Old Warden on an 1/8" rubber Hi Start. Trim ended up at about -4deg on the stab and 48% CG. Flight times average about 40sec much the same as Dave Clark's standard 32" span Gnome. Directional stability is not yet up to the performance of a standard Gnome. The model sometimes piles in right (no damage usually) and I am modifying the fin to increase the side area aft of the CG. Getting the model off the line was initially a problem, resolved by bending the tow hook to an obtuse angle.